Following President Jacob Zuma's apology live on TV on Friday night is the 73-year-old leader likely to see out his remaining three years in office? 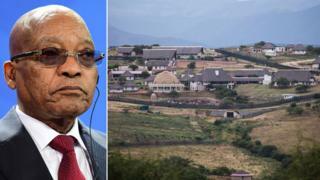 The ruling on Thursday by South Africa's Constitutional Court - that he breached the country's constitution by refusing to repay government money spent on his private home in rural Nkandla - has left him with limited room for manoeuvre. This was always going to be unlikely to happen, and the odds lengthened even further after Friday's apology. President Zuma is not someone who gives up easily. He is a master strategist who always tries to be ahead of the game. The Youth League and Women's League of the governing African National Congress (ANC), key groups, have already come out to support him. The opposition in parliament led by the Democratic Alliance (DA) has already filed a motion to move for impeachment. They also rejected his apology, saying it was "an insult to our intelligence." The word impeachment does not actually appear anywhere in the South African constitution. The phrase used under Section 89 is the Removal of President. But for now, let's agree to use impeachment. They would need a two-thirds majority - that is 267 MPs out of 400 - to succeed in their quest to remove Mr Zuma from power. Unfortunately for them the numbers do not stack up. The DA is the largest opposition party but has only 89 MPs, compared with the ANC's 249. They would need a significant number of ANC MPs to vote with them for this to happen. Julius Malema's radical Economic Freedom Fighters has 25 MPs. Even though DA leader Mmusi Maimane told me he thinks ANC MPs would vote with their conscience, I think it is still highly unlikely. The ANC responded within minutes of President Zuma's TV address, rejected by opposition parties, to say it "welcomed the president's apology" and stood by him. But do not mistake Friday night's public show of support for Mr Zuma as the voice of a unified party. The ANC is bitterly divided now. There are those who would agree with the motion because they are keen to see the back of their leader. But others would never vote against a leader who was elected at an ANC congress with a majority mandate from 5,000 delegates. If impeachment fails, it means the president stays. However, the DA can call for a Motion of No-Confidence. The difference between Removal of President (i.e. impeachment) and Motion of No Confidence is that the former is a punitive measure. By going through the impeachment route, the DA wants to punish the president, Lawson Naidoo, executive secretary of the Council for the Advancement of the SA Constitution, told me. "If the president is removed through this process he loses all the benefits of his office, for example he will not receive his pension. He also cannot hold any other public office. But if he is removed through the motion of no-confidence, he can receive benefits." The DA also said it would go back to the Constitutional Court to make it difficult for the ANC to justify keeping President Zuma in office. Even if they do that, it would be hard to see how any judgement from the judiciary would order the president to step down. Under South Africa's electoral system, there is no judge who can remove a democratically elected president. Separation of powers prohibits the courts from ordering the firing of an official elected by the will of the people. Even Chief Justice Mogoeng Mogoeng pointed this out during Thursday's historic judgement. He said: "It falls outside the parameters of judicial authority to prescribe to the National Assembly how to scrutinise executive action‚ what mechanisms to establish and which mandate to give them‚ for the purpose of holding the Executive accountable and fulfilling its oversight role of the Executive or organs of State in general. The mechanics of how to go about fulfilling these constitutional obligations is a discretionary matter best left to the National Assembly". Even though the top six leaders welcomed Mr Zuma's no-resignation-apology, the ANC's 100-member national executive committee can convene a special meeting and ask the president to resign, and replace him with the current Deputy President Cyril Ramaphosa. This would create the dreaded two centres of power that the ANC has tried to avoid since 2007. It would mean Mr Ramaphosa would be president of the republic while Mr Zuma remained head of the party. There was some talk that the party term, which ends in 2017, ought to be aligned with the national election scheduled for 2019 precisely to navigate away from having two separate individuals running the state and party respectively. According to the constitution, there is a two-term limit for the president. The ANC does not have a limit, even though it punished Thabo Mbeki when he wanted to stand for a third term as party leader but knowing that he would step down as head of state. This could well happen but probably only after the municipal elections expected later in the year. In other words, the jury is still out on whether Mr Zuma could be recalled. The ANC does nothing at all and sticks with President Zuma at the helm. And for now, given the rallying call to support him after he apologised live on TV, this seems to be the case. The most plausible outcome is that the ANC will wait until after the municipal elections due later this year before it makes any move. There is an argument that it is too risky to remove Mr Zuma now as it would cost the party dearly in the forthcoming polls. But there is another hurdle which might force party officials to move ahead of time. In a couple of months, a Pretoria High Court is expected to deliver a ruling on whether to reinstate corruption charges against Mr Zuma. The DA took the matter to court because it believed the decision to drop over 700 corruption charges shortly before Mr Zuma became president in 2009 should not have happened. This is likely to further tarnish the name of the ANC in the middle of an election campaign. No-one at party headquarters in Luthuli House would want that, particularly after the hurricane ruling by the Constitutional Court this week.